Published by Mountainblog on 01/19/2015 . 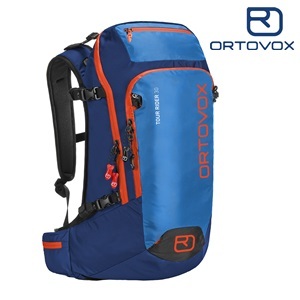 For the 2015/16 winter season ORTOVOX has completely revamped the ALL MOUNTAIN backpack line. Of these, the TOUR RIDER 30 is the ideal backpack for long day tours. This model impresses with its numerous carefully considered features. Tourers can access the main compartment from the back or the front. Load control cords, in combination with the foam back and ergonomic straps, provide optimal weight distribution. In addition, the skis can either be attached diagonally or in the classic manner – equally, two straps enable the carrying of snow shoes or snowboards. Along with a helmet-fastener, the TOUR RIDER 30 also has an ice axe and hiking pole attachment as well as the obligatory ORTOVOX quick access to emergency equipment.